Hydraulic valve solenoid in the machine's hydraulic system used to change the direction of liquid flow, liquid distribution, oil and so connected and close. A variety of valve structure, such as: two, 4/2-, 4/3-way, three five and so on. Two two-way: that is, you can change the width of the spool in the solenoid valve under the effect of two different locations, but only two openings, that is further out. 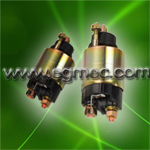 Valve solenoid with AC and DC of the points, depending on its power supply and control system selected.